Creating an Albania travel itinerary seems easy at first as there are only a few well-known places. But if you delve a little deeper into the best places to see in Albania you’ll find a country with so much more to offer than just the quirky remanence of its communist past. Two weeks in Albania is a great amount of time to see some the most beautiful areas of the country and make your way around without hurrying too much. One week in Albania could be a bit short but if it’s all you have then stick with Tirana and one or two easy to reach places. Below are two one-week itineraries and a two week itinerary for Albania as well as some other ideas for spending longer in this beautiful, diverse and affordable country. View of the beautiful Albanian coastline. One of the best places to see in Albania and you shouldn't miss it in your Albanian itinerary! The weather in Albania is perfect for travel during most of the year. The temperatures vary a lot from north to south but the shoulder seasons often have warm temperatures and sunny days. Summers can be very hot so make sure to factor in some beach time. We were there throughout September and it was still up to 30°C on the coast. We drove with our van and thouroughly recommend having your own vehicle. It gives you so much more freedom and flexibility in your itinerary. There are also lots of amazing places that aren’t reachable by public transport in Albania. For more information about road conditions and petrol prices read our info about driving in the Balkans. A road trip around Albania is the best way to visit all the best places to see in Albania. Buses in Albania are mostly reliable and cheap. Make sure you check times in advance but also leave some flexibility. The roads aren’t great in some areas so the distance may not be an accurate measure of the time it takes! It is possible to hire drivers for almost any journey in Albania. Your accommodation will be able to organise this for you. This can be a good option if you are a group of people or want to reach somewhere more off the beaten path. We travel on a budget of €25 per person per day and found it easy to stick to our travel budget in Albania. Depending on you travel style Albania can be very cheap. Here are some example prices to give you an idea how much to budget for Albania. Tirana is a must on your Albania itinerary. A trip to Albania wouldn’t be complete without a visit to the off-beat capital, Tirana. From museums in bunkers to cable car rides and rotating bars there are loads of interesting and fun things to do in Tirana. With plenty of options for budget travellers and a few splash-out experiences this city caters for all. Check out our full Tirana city guide for more recommendations. This often missed little city in the north is worth a stop off. With incredible castle views, cute restaurant-lined streets and some interesting history, you’ll find plenty of things to fill a day or two in Shkoder. It’s also the gateway to Theth for the famous Theth to Valbona hike. Check out our Shkoder city guide. We stayed at the most amazing campground with a luxury pool and a brilliant restaurant onsite. It now has cute little cabins available as well as private rooms and dorm beds. Have a look at prices here. This is one of the most stunning areas of Balkans. A day trip from Shkoder will take you to the gorgeous little mountain town of Theth. From here there is an incredible day-hike over the mountains and into the Valbona National Park. The hike is challenging but rewarding and ends in Valbona village for a cold beer and a good night’s sleep. The next day, a ferry trip along the beautiful Komani Lake will lead you back to Shkoder. Find out more information about the Theth to Valbona hike. One of the beautiful coastal towns, definitely worth a stop on your Albania itinerary. Just half an hour from Tirana is the brilliant Albanian coast. With only one week in Albania you won’t be able to fully explore all the beaches but Durres is a good start. The town has a pleasant waterfront, an amphitheatre and some cool street art to explore but the real draw card is the beach. Kilometres of white sand stretch south from town and are the perfect place for a day in the sun. The beach is really busy during the summer months but is the perfect escape in the shoulder seasons. Beautiful town and a must-see during your Albania travel itinerary, two weeks in Albania. One of Albania’s UNSECO Heritage sites, Berat is also know as the city of 1000 windows. You can spend a peaceful day wandering the streets of the old town and enjoying some traditional Albanian food. It is possible to reach Berat as a day trip from Tirana but it would be more relaxed to spend the night here. 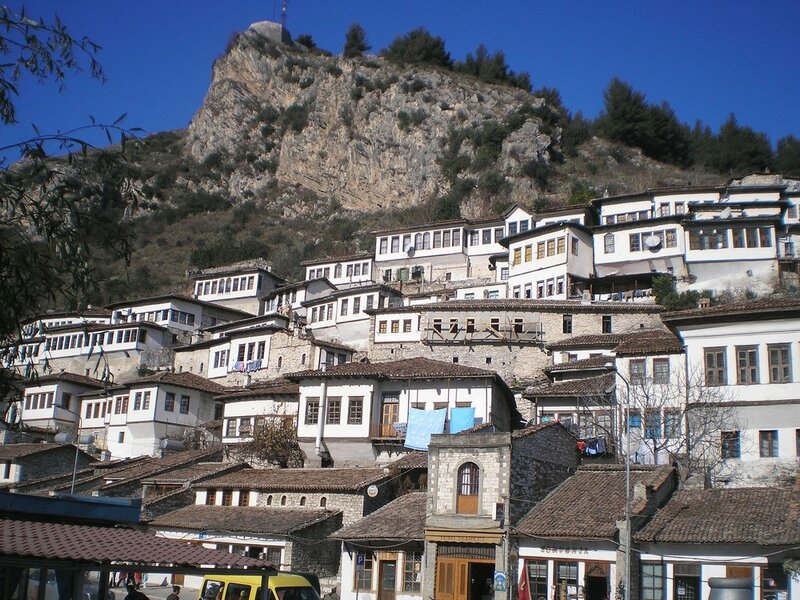 Have a look at accommodation options in Berat. Choose one of the one week Albania itineraries from above and then add on whichever of these awesome places in Albania take your fancy! Don't miss Albanian beaches in your Albania travel itinerary, the best places to see in Albania. If beaches are your thing then make sure the area around Himara is on your list. Crystal clear waters and beautiful views await you on the shores of the Albanian coast. Himara itself is a charming small town and the ideal base for exploring some of the other bays in the area such as the beautiful Gjipe. Gjipe requires transport and a walk down to it which puts a lot of people off, leaving this hidden treasure to those who put in the (well worth it) effort. If you have a van or a tent consider the campgrounds at Livadh beach. Or better still, try some wild camping. We’ve made a list of all our favourite wild camping spots in Albania. Beautiful clear waters not to miss in your Albania travel itinerary. Heading inland again you’ll find the Syri Kalter or ‘Blue Eye’. There is also one near Theth in the north but this one is more well known. A long a gravel road you’ll find a natural spring with some of the clearest, bluest water in the world. It’s a cooling 10 degrees celcius but if you feel like a dip you can jump in. There is also a small restaurant next to the river. The beautiful stone roofs of Gjrokaster are a must see in every Albania travel itinerary. Not far from the Blue Eye you come to the UNSECO Heritage town of Gjirokaster where the roofs of the houses are made from stacked flat stones. The town is interesting to wander through and there are plenty of nice cafes and restaurants (although a little overpriced). The castle is a must-see and has some amazing views down over the old town and the vast plains beyond. If you reach here for the afternoon have a look at some accommodation options for spending the night in Gjrokaster here. If you find more time for your trip to Albania you can extend your time in some of the places mentioned above or visit some new ones. Here are some more ideas of places to visit in Albania. thermal pools albania travel itinerary, Albania in one or two weeks. We stumbled across these by accident but once we saw a sign to thermal pools we couldn’t ignore it. You will need your own transport to get here or to hire a driver but it’s worth it. The river in this valley is formed by sulphur springs and along the way locals have created pools out of rocks. There is also an ancient bridge going over the river. There’s not usually many people about but you might find some elderly locals soaking their joints for the benefits sulphur is said to bring. Add Korce to your two weeks Albania travel itinerary. We stopped here because it was on our way towards Macedonia but were pleasantly surprised by the things to do in Korce and the array of restaurants and cafes. There is a beautiful church in the middle of town at the top of a pedestrianised street. Along the street is Albania’s first school and a quirky looking observation tower. We had a very comfortable stay at Hotel Kristal. Kruja is one of the best places to see in Albania. We didn't make it to Kruja but our friend Lavdi over at Kosovo Girl Travels has all the info you need. Have a read of her article about Tirana and Kruja. Make sure you make time in your itinerary for these 20 awesome things to do in Albania. Feel free to ask any Albania related questions below or read more of Balkans info if you're heading to other countries in the area. You can find everything Balkans here. This post contains affiliate links. If you book or buy something through one of these links we make a small commission at no extra cost to you.